The US Tsunami Warning System said widespread hazardous tsunami waves were possible within the next three hours on the Pacific coasts of several central American countries - Mexico, Guatemala, El Salvador, Costa Rica, Nicaragua, Panama, Ecuador and Honduras. Seismologists have warned of a tsunami of more than 12 ft.
At least six have been killed including two children after a massive 8.1 earthquake struck off the south coast of Mexico triggering a tsunami. The only tsunami detected so far, however had a largest wave measured at 2.3ft, experts said. The death toll has already risen to at least five people, including two children in Tabasco state. Tabasco Gov. Arturo Nunez said that one of the children died when a wall collapsed, and the other was a baby who died in a children's hospital that lost electricity, cutting off the supply to the infant's ventilator. The quake hit offshore in the Pacific, the US Geological Survey said, putting the magnitude at 8.1. 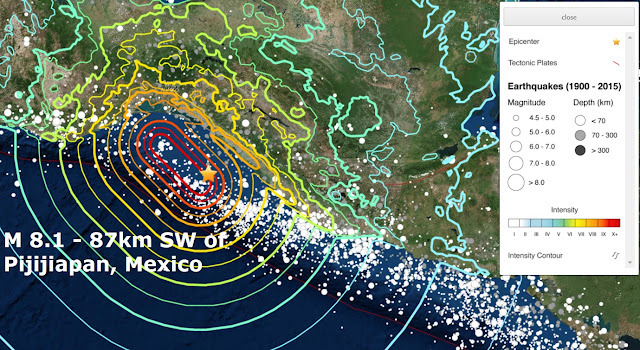 But Mexico's seismologic service gave a magnitude of 8.4, which if confirmed would be the most powerful ever recorded in this quake-prone country. Terrified residents fled into the streets amid chaotic scenes in the wake of the huge tremor. 'The house moved like chewing gum and the light and internet went out momentarily,' said Rodrigo Soberanes, who lives near San Cristobal de las Casas in Chiapas, a poor, largely indigenous state popular with tourists. Chiapas Gov. Manuel Velasco told television station Televisa the roofs of homes and a shopping centre had collapsed in San Cristobal. Buildings swayed strongly for more than one minute, loosening light fixtures from ceilings. Helicopters crisscrossed the sky above Mexico City with spotlights. Some neighborhoods kept electricity while others remained in darkness.